A swimming pool can serve as the foundation of a backyard resort and provide a great return-on-investment—especially if it becomes the setting for years of fuss-free staycations. No need to endure the time, expense, or vacation hassles that come with packing, hotel booking, airline travel, and jet lag. Instead, just saunter out back to your aquatic retreat and enjoy outdoor living at its best. If you have included staycation-style features on your swimming pool such as slides, waterfall grottos, and swim-up bars, you already have a head start on creating vacation living at home. But why stop with the swimming pool? Whether you already have a pool or are planning to build one, consider adding a host of other outdoor upgrades surrounding the pool to enhance the setting for resort-style living. A range of possibilities can make your backyard feel like a five-star getaway. For inspiration, start with the collection shown here of 10 great options to boost your staycation elation. They provide nighttime warmth, stylish shade/shelter, delicious dining options, and enjoyable outlets for active fun. If you’ve spent time at an ocean-front hotel or one with a grand swimming pool, you may have seen the tent-like cabanas on the beach or pool deck available for daily rental. 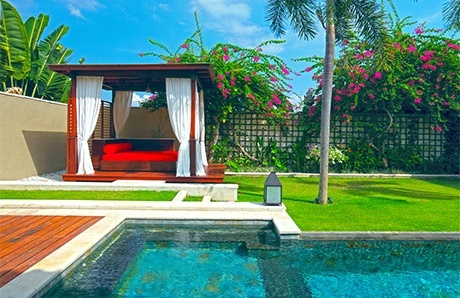 Typically, cabanas are large enough to provide shade and privacy for two people—although large-scale versions that can hold a small group are also available. Why not put one of these stylish outdoor shelters next to the pool in your own backyard? Most come prefabricated, although more elaborate ones can be custom-built in wood or dense polymer. These structures usually rectangular, and they have fabric “roofs” to provide shade. You can furnish them with lounge chairs or comfy daybed with pillows to lay on. Most come with frames that enable you to hang curtains that you can draw for privacy or greater sun protection. A backyard with a gazebo creates a charming, idyllic setting for outdoor dining. A wide variety of designs are available, but all have a solid roof, and they are usually round or octagonal. Structural components usually come prefabricated of either aluminum, plastic/polymer type materials, or sturdy, often intricately carved wood. 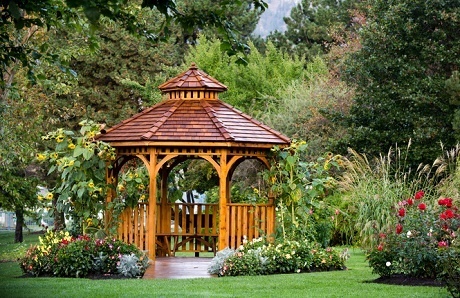 Typically, a gazebo has a solid floor constructed from wood or poured concrete, but you can also place the structure directly on a deck or a grass lawn. Gazebos offer the perfect balance of sun and shade and a semi-enclosed setting for a table and chairs. They provide the perfect backdrop for an open-air dining room in your backyard. Take your backyard landscaping aesthetic to the next level by adding a latticework-framed pergola. A pergola, as you may have seen in restaurant patios, is an exposed, trellis-style roof built with slats of wood. What makes them particularly attractive is growing plants with winding vines across them—creating a natural open-air ceiling over a patio or outdoor dining or living area. 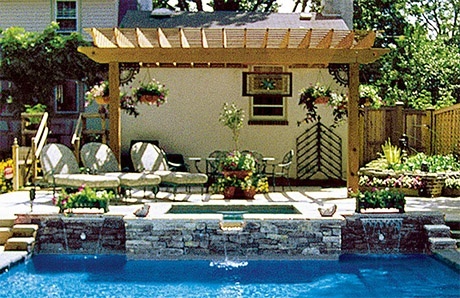 Another great option is to build a pergola over your in-ground spa or hot tub to provide some shade while you’re in the water. Designed with functionality in mind, a pool house provides a permanent structure that makes poolside living easier, cleaner, and more convenient for everyone. Wet, dripping swimmers can avoid your main home, and instead use this permanent addition for bathroom breaks, showering, washing pool water from their hair, or changing in and out of swim suits and dry clothing. And if it’s a truly hot day, adults can escape here for a respite from the heat while remaining near the pool to keep an eye on the kids. Your pool house can be a small, simple building with a shower and changing room, or it can be so large and elaborate it functions as a virtual miniature second residence on your property. 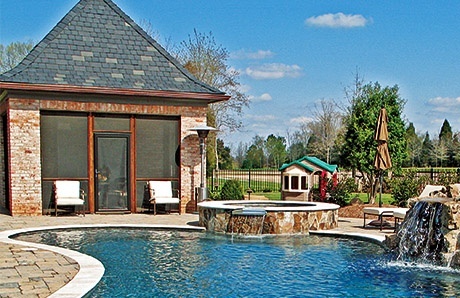 Pool houses may have a simple kitchen, bathroom, small living room, and even a spare bedroom. They often come with a full utility hookup for water, power, and plumbing. Most homeowners prefer the pool and landscaping to take center stage, and they set their pool house off to the side in the background. Parties and get-togethers around your pool are even more enjoyable when you’ve got a handy place to cook and grill for hungry guests. A stand-alone island BBQ is a beneficial addition that adds both personality and functionality to your backyard space. What makes a grill into an “island” is when the grill is installed into a solid, free-standing structure—versus a portable grill that rests on metal legs. 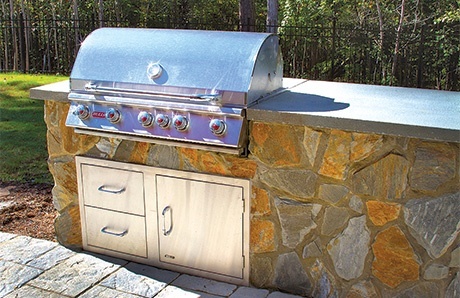 Custom island grills can be installed on site. You can choose from a variety of models in different sizes; the most common are 450 to 500 square inches of cooking space, but for big-time cookouts, you can have one as large as 550 to 650 square inches. Common features include a hood to control smoke, and they are available in models that burn either charcoal, natural gas or propane. Grills can be simple, consisting only of the cooking space and hood. Or, they can include island counter surfaces and storage drawers and cabinets. Storage is extremely helpful to keep cooking supplies or culinary accouterments such as tongs, skewers, grill ware, spatulas, or other food-prep accessories. 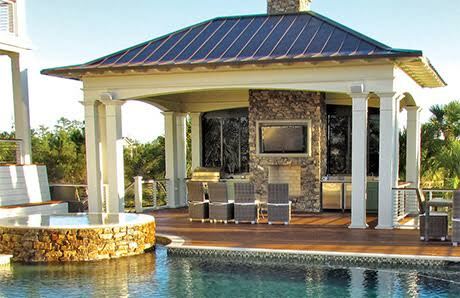 If you install your island grill at the same time you build your pool, you will enjoy additional design opportunities. For example, many homeowners coordinate the tile or stone that covers the exterior of the island grill with the materials used in their pool’s tile-line, perimeter coping, elevated spa, and raised bond beam. A grill is essential to hosting a delicious backyard barbecue. However, if it’s in your budget and your family spends a lot of time around the pool, take outdoor grilling to the next level with a full-on outdoor kitchen! Your mix of appliances can include a sink, bar, stove-top burner, beverage chiller, mini refrigerator, or even a pizza oven. Make sure you purchase appliances that are outdoor-rated so they can withstand the elements and be used year-round. Go for whatever shape fits your design and space—from circular to L-shaped. You can have a solid ceiling as well. And add tables, chairs, and barstools that fit the kitchen’s overall configuration. Keep in mind that your outdoor kitchen should allow for cross ventilation to help prevent smoke from building up. In addition, do not position the cooking area in an enclosed patio or underneath a covering without a grill vent hood to control the smoke. Similar to an indoor fireplace, an outdoor version typically includes a firebox and a chimney. Some are designed only for burning wood, while others with gas hook-ups give you the option to quickly get a fire going. Outdoor fireplaces are typically built in brick, stone, or concrete that can withstand the heat and the elements. Fireplaces are both decorative and functional. They often serve as a design focal point, and they help create a cozy ambiance. Along with providing heat, some versions can be used for simple cooking, such as roasting a hotdog or toasting a marshmallow. After a long day, a roaring fireplace is where many couples like to relax, cuddle, and sip a glass of wine. Whether you’re having an at-home date night or making s’mores for the kids, always keep safe around open flames. Don’t leave children unattended, keep furniture a safe distance away, and be aware of any community burn bans. Compared to outdoor fireplaces, fire pits are typically more affordable, require less room, and can be located anywhere. Both offer an alluring way to light up the night. And both offer an enticing warmth and a reason to stay outside in the cooler fall and winter months. 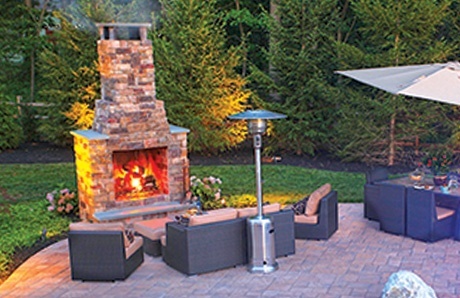 When it comes to fire pits, you have two general categories: The first is a prefabricated, portable model that you can simply set out in your yard (if it burns wood) or have plumbed for natural gas. The second is a custom project that homeowners add during pool construction or a backyard makeover. Typically, these are built frim concrete, they are plumbed for gas, and they are covered with decorative stone or tile. For fuel, it’s up to personal preference to choose between fire pits that burn wood, natural gas or propane. 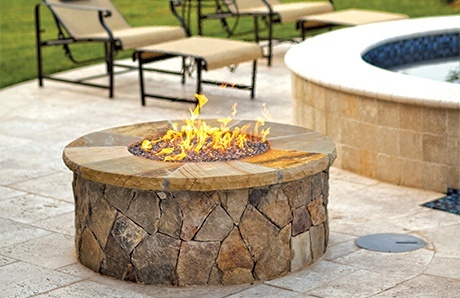 Whether portable or custom, most fire pits are round in design to best facilitate group socializing. However, you can have any shape, size, or style to match your deck, pool coping, and other backyard hardscape. Typically, they range in diameter from 3 feet (for smaller, more intimate fire pits) and up to 6 feet (for entertaining larger groups). Common heights are 12 to 24 inches tall; some experts like to build them at 18 inches tall—the sweet spot for enabling people to sit in chairs and comfortably prop their feet up along the perimeter. On the design front, one popular trend decorative “fire glass.” These clear or colored tempered glass pebbles lend a modern flair to a fire pit, and they are manufactured to withstand flames and retain heat in gas fire installations. 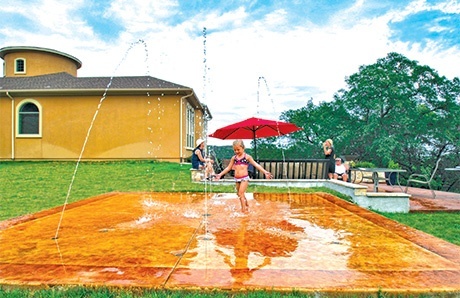 Inject a little “water park-style” fun into your own backyard with a splash pad near your pool. The pad’s arcing jets of water are great for children who have not yet learned to swim but want to enjoy the water. Kids, as well as grown-ups, can enjoy playing in them to cool off without getting completely soaked. These pads consist of poured concrete that’s coated in your choice of decorative colors and patterns. You can even pick your kid’s favorite mural-type theme—anything from a pirate ship to outer space. Some splash pads come with controls and programs. 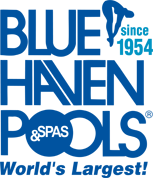 These systems allow you to create an aquatic playground where you can select the speeds and heights of the water jets to best suit your children’s ages and heights. The coating is texturized to help prevent slipping. These installations are professionally plumbed to provide water flow to the jetting units to create the arcing sprays. Keep in mind: The pad can serve a second function in winter months when it’s too cold to get wet and in summertime when you have lots of guests over: Set up a table and chairs on it, and entertain atop the surface. 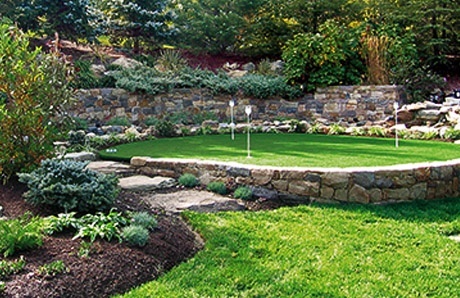 Golf enthusiasts can work on their short game by installing a putting green at home. You can create your own practice range made of special putting turf designed for any size or shape specification that’ll fit your backyard country club. Most putting greens cost between $15 and $25 per square foot. You can have one landscaped by professionals. Or, buy a custom turf that can be shipped for DIY installation. If backyard space is limited, consider purchasing a golf green that floats in the pool. To use it, set up the tee box on the deck of your pool, and then chip balls onto a synthetic, floating green that rolls up for compact storage. Everybody’s notion of an ideal staycation and a backyard resort is different. You can choose from these ideas for amenities, and combine them in whatever manner serves your family’s needs and interests and matches your aesthetics and lifestyle. Sure, you’ll want to get out of town every now and then—but it makes all the sense in the world to make your home and backyard oasis a pleasant, inviting place to spend your leisure time.